Narrator: There are gajillions of stories of mischief and fun, but to keep things simple, let's start with just one. About a mom and two kids and a house and a hat - that, oddly enough, was worn by a cat. But soon enough we will get to all that. Q: How true is this to the orginal book & TV special? This movie isn't entertaining. It's that simple. The jokes aren't funny, the acting by the main character is terrible. Dr. Seuss is spinning in his grave. The makers of this movie took a childrens book, threw in unnecessary sexual innuendo, and stuck it on a screen near you. The movie plays itself out with joke-a-minute style. Unfortunately, none of the jokes are funny. Both the children's humor and the adult humor fails to please. Which brings up another point. Adult humor has no place in this movie. I have no problem with adult humor, but it shouldn't be in a Dr. Seuss movie. Not only was the adult humor unfunny, it did nothing more than cause confusion for the kids in the audience. Not to mention the explanations parents have to come up with when kids question the jokes. Mike Myers is just bad in this movie. I had to go home and watch my collection of his movies and a few old Saturday Night Live episodes to reassure myself of his comedic ability. He completely failed to give the Cat a unique personality. 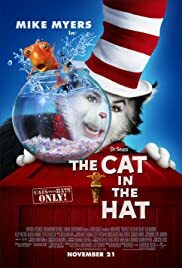 If you're looking to see Myers perform half of his different SNL and movie characters in the period of an hour and a half, all while wearing a hideous cat suit, then watch this movie. If you do get stuck seeing this atrocity, there are some redeeming points that will make it bearable for you. The sets are beautiful, almost a perfect rendition of what most people think a three-dimensional version of the Seuss universe would look like. Also, the performances of Dakota Fanning and Spencer Breslin are applaudable. Had they not been required to share the spotlight with that ungodly cat, the movie could've passed for good. Oh, and there's a scene where Myers is abused by a group of children, which provides some comic relief. Unfortunately, the Cat survives this incident to abuse the audience for another twenty minutes. 137 of 209 people found this review helpful. Was this review helpful to you?